S/he wears _______ clothes and costumes all the time. Maybe s/he is a _______. I would use Flamboyant. A person with a showy style. The word doesn't just apply to clothing but to any extravagant style of behaviour. As others have said, in times gone by the words fop and dandy would have been common. However, they would nowadays be taken to referring to the Regency period. Ostentatious or showy for negative connotations. "He was somewhat bohemian in appearance..."
I normally love your questions but I'm afraid this one does not work! "The two photos are TOTALLY DIFFERENT, the only similarity is they are both human beings. The second photo is just utterly normal, everyday, Harajuku street wear (ultimately just a reflection of ordinary 1980 punk youtube.com/watch?v=1Tko1G6XRiQ ). (The particular photo is rather out of date, so, circa 2010 not 2015, but that's a detail.) You can easily find, trivially, 10 to 20 million people who dress like this as normal every day wear in many countries presently. It's just ordinary "Harujuku style". It's as uninteresting as saying "preppy" or "80s" or whatever, you know: a completely developed and finalized everyday fashion style. In contrast anyone who, as you said, literally wears photo1 ("child's fancy dress") in normal circumstances is profoundly bizarre and unusual ... way beyond merely iconoclastic!" Jano - is there a chance that Photo1 is, quite simply, not actually representative of what you genuinely meant, on further consideration? If so click edit and remove it. SO, this person (may) be a "cosplayer". If the person truly dresses literally as in your photo (in normal settings .. lunch, work, coffee shops etc) I'd really go with "Eccentric" as Christopher said. (another word you may be looking for, Jano). Dressing like the mad hatter is just .. silly, eccentric, "truly quirky". Iconoclastic is, well, check a dictionary, but it's different from that. For example, I often show up in my pyjamas to shake up a board meeting - that's precisely iconoclastic; casual to a wedding or a tux to a rock concert is "iconoclastic". This is something else, you would have to describe it as "conceptually iconoclastic", or some such! The word paradigm would possibly come in to play. "This person lives and dresses by a whole other paradigm." Going back to "cosplay", it is very specific - the person either is or is not a cosplayer (I guess this would be determined epistemologically by "asking them"). That style is not, really am cosplay theme (which leans more to anime or furries). 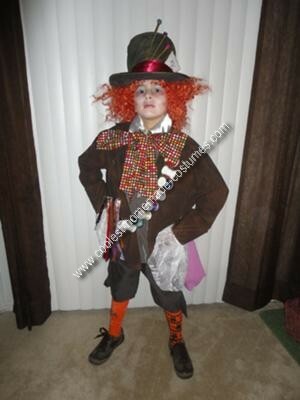 As pointed out by @Mari-lou A and @Shoe the first photo is of a 'Mad Hatter' and therefore is fancy dress costume. The second photo is of a young woman whose attire is no different to many other young women. The only words which connect how they are attired are clothed or dressed. On the basis that someone would normally wear fancy dress in everyday life such as in the first photo then you could then describe them as a fop, dandy or just plain eccentric. As noted by Joe Blow, Staying with the period, you could call a person a Beau Brummell; a noun taken from George Bryan Brummell 1778–1840, an Englishman who set the fashion in men's clothes. Another definition is an extremely or excessively well-dressed man. refers to a more recent era. However the definition 'extremely or excessively well-dressed man' could still be applicable. The gentlemen in-question could be called as having a cavalier style in his dress sense. Other words you could use are fop or dandy. You could also say their dress style is old-fashioned. Or maybe you could just term them eccentric. If you don't mind the connotation of their looks also being tasteless, there's Gaudy. A full 50s head-to-toe look is kind of costumey, you're right. I think the best people can do if they want to do head-to-toe 50s is just embrace the costumey look and go with it. You can totally get away with it around at weddings, or holiday parties, or what have you, but for everyday wear...yeah, costumey is the way it is. resembling a costume and therefore unrealistic ⇒ "'It's a little costumey. Like what a little girl thinks a real woman's lipstick looks like.'" A bit of a stretch, but a flavorful loanword from French is flâneur. It literally refers to the act of walking, but was used in 1800s France (and in modern times, esp. art-historical circles) to refer to people who walk around for the purpose of showing off their clothing and lifestyle. The people in Caillebotte's famous painting are flâneurs. As the current top answerer already posted, and beat me to the punch. The word flamboyant, to me, seems to describe both individuals very well. I do not think there is another word that could fit so well. And if there is another word. I doubt it does any better a job than "flamboyant". Many people have found fault with this question, but I see none. The fact that both images are not extremely similar to each other does not make the question absurd and certainly not impossible to answer. Also the fact that one method of dressing is more common in certain areas of the world, while also being vastly different than the other photo, just makes answering more difficult. And that is not necessarily a bad thing. Although the other answers are interesting (I even learned the word iconoclastic for the first time), most of them only fit one photo, but not both. Or were too presumptuous of one photo or the other to make sense as an answer. The boy is dressed in what can easily be described as a flamboyant outfit. The girl has bright magenta accents and pink stripes in her hair. 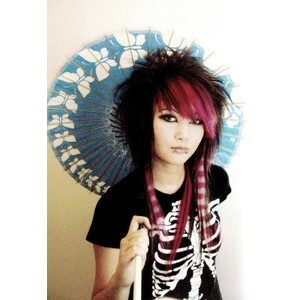 She has a light blue parasol with white butterflies that clashes against the black of her hair and top and her eye make-up. She also has silver facial piercings. All of this decoration, bright colours and contrast can be described as flamboyant. The fact that it is somewhat popular does not detract from the fact that many people will consider this flamboyant. Someone who perhaps dresses like this themselves and is around others who dress in the same style as the girl will not find her to be flamboyant. Because it is not very special and doesn't stand out to them. But I think to the majority of the world the way both people are dressed here would be seen as at least out of the ordinary from the people they usually see day to day. Adjectives can change who or what they fit simply based on the common perception of the people using the word. For example imagine some place where commmonly everyone dresses in bright orange glowing clothing with blue stripes and a 7-inch feather sticking out from their head attached with a band. And one person (call them "Jake") decides to dress in glowing red, orange and blue clothing with green stripes and a 13-inch feather sticking out of a long brimmed hat. Among other things, Jake would probably be viewed as flamboyant by the common people. Whereas to "us" both Jake and everyone else around would seem almost equally as Extravagant, Ornate, Flamboyant, etc. Strange example but I think it explains what I'm trying to get at. "He/she was wearing a kooky outfit". Is there a term for someone who uses words like “thee” & “thine” in their daily language? What is the shortest commonly-used word or expression that describes both the delivery of services and of goods?